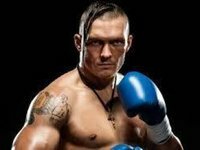 Ukrainian boxer Oleksandr Usyk defeated German boxer Marco Huck via 10th round TKO and advanced to the semi-finals of the World Boxing Super Series, successfully retaining his WBO World Cruiserweight title. The fight was stopped in the tenth round. Ukrainian President Petro Poroshenko congratulated Usyk. "Congratulations, Oleksandr Usyk, for your convincing victory over Marco Huck. Keep it up, champion," Poroshenko said on his Facebook page after the fight.